Discussion in 'Trail Cameras' started by pinetag, Dec 3, 2018. So I'm fairly new to running cameras and the ones I have used in the past never captured a whole lot. 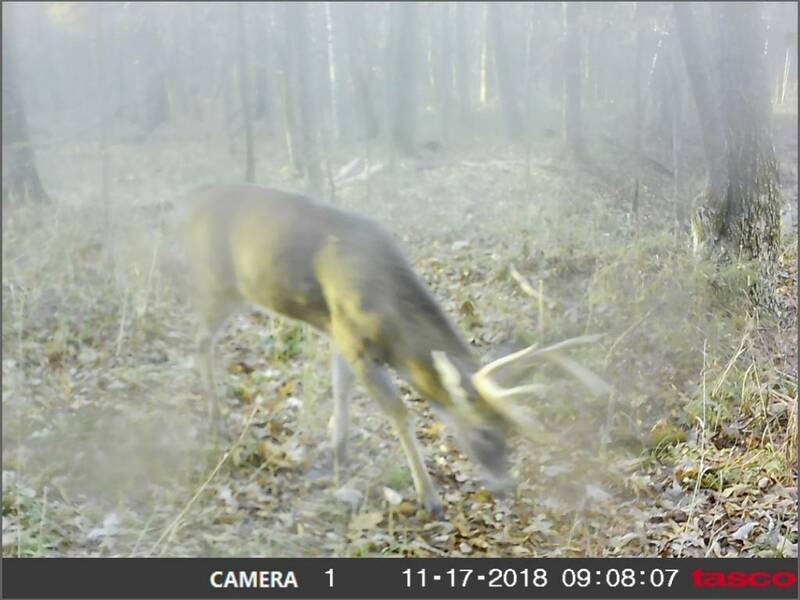 Having said that, I got a pretty nice buck on camera and was curious what you guys thought about score? I know how to score but I'm not as familiar with it as many of you so I'm thinking 120's. Anybody want to take a shot? This is the only pic I got of him. more important, why weren't you in the stand on Nov 12th??? True, true...but I was actually trying to hunt with a buddy that day and it didn't work out. Guess I should have just picked up and gone myself huh? Okie is right though about the wind. I can only hunt this stand with a wind coming from a southerly or easterly direction. I did have a close/not-so-close encounter with this buck on the 17th. I was in a stand about 500 yards away due to wind direction. LOL. 120 +/- unless those g2’s are longer than I think. Nice deer. I’m at 115. MB - 18, G1 - 3, G2 - 8, G3 - 6, H1/H2 - 4, H3/H4 - 3, IS - 17. +/- 5 inches. So i wasn't too far off based on these estimates. Anybody else think he might have double tines on the inside of his left main beam? When I first looked I thought it was just part of the dead cedar tree laying in the background but something about the lighting makes it look like it might be part of the rack, even zooming in. Maybe just wishful thinking on my part but that would be a very unique rack if that's the case. I thought that at first, but I zoomed in and it looks like part of the down tree in the back. Also based that on the other antler not having any junk. Thanks for the input guys. If he makes it another year and stops by my place again, he won't be getting a pass I can guarantee ya. I'm not far enough along in my mature deer hunting career to let one like that go. 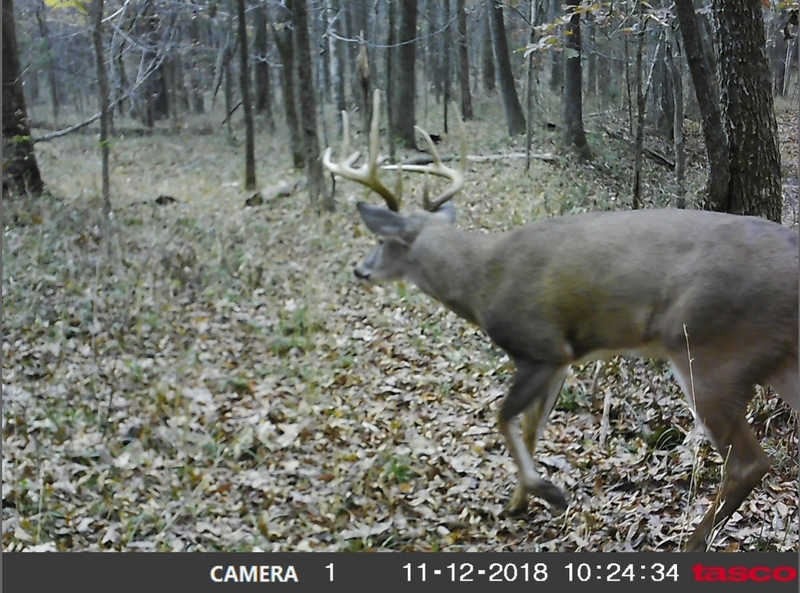 He would be my biggest buck to date. I'm just excited to have gotten a pic of one like that! He could go 130. I hope you find at least one of the sheds so you can finish this saga. Good point on the shed hunting. I didn't make that a priority this year because I had just closed on the property at the end of Feb and there were so many things to work on. I should be able to get out and do some searching this spring though. I bet he's at least 120". Very few deductions on that deer. I had lots of pictures of a nice 10 point last year. I was guessing he'd score around 120-125". A neighbor shot him in late November, 142" gross. He had a large kicker below his brow, probably more like 130" with all the deductions. Trail cam pictures can be really hard to score accurately.